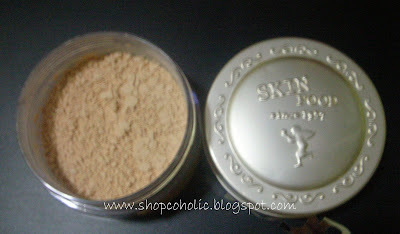 This powder deserves a product review..
Love it so much that I'm on my 2nd tub right now! This loose powder with its soft, fine particles offers a bloomingly radiant, flawless finish. After foundation, dap gently in following order: forehead→eyelids→cheeks→lips. Press remaining residue gently under eyes. * sponge included is very soft! * its scented! I have Allergic rhinitis and have a very sensitive nose. I'm very particular with scented face products, as much as possible I try to avoid them. 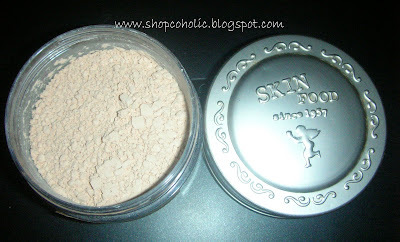 But this powder is really good... so I'll keep on using this til I found a good replacement. * packaging is kinda bulky if you plan to take this around. I prefer touching up using pressed powders ( I use MAC blot or Skin Food's Lemon pact powder). Be sure to test the powder before buying, my friend bought this product and found out that she's allergic to it! Always wash/replace the puff. I'm using velour puffs, its very economical since I can wash it many times and still looks good as new. It looks like this..
Bought mine from a local department store, its a Japanese brand. It costs less than php 100 for 2 velour sponges! Not bad noh?! 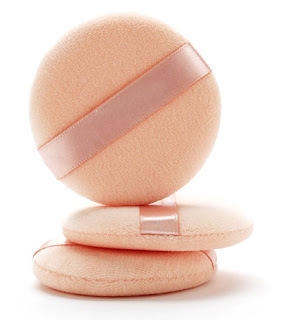 I prefer using a puff to set my concealer and foundation so that I can get more coverage.. and I don't want powders flying around when I use a brush (*sneeze*..*sneeze*)! Just press the puff gently all over your face to set foundation. As what I've said, will keep purchasing til I found a good replacement for this. What loose powder are you using? Can you recommend an inexpensive loose powder that's unscented? Let me know! =) muah! 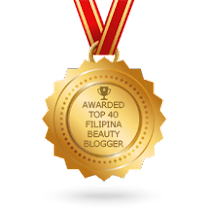 nice review kim.. i am in search for a good loose powder.. I have allergic rhinitis too.. i hate it when a product is overtly scented..
@donnarence - naku, pareho pala tayo! grabe kakaiinis noh?! I'm still looking for a good powder to set my makeup. Maybe I should try this.. Thanks for the review! i've also done a review on this L/P , and i love it too. i agree on the oil control, it's pretty good. um I use maybelline mineral powder. It's unscented and quite good. I have sensitive skin so I prefer this product. Thank you for the review! I have been lemming on this since years ago, but i decided not to buy this one since it's a bit pricey. I however, opted for the TFS flower line for powders which also has the #21 and the lavender shades. I htink they have the same quality, only that, skin food is a splurge. i love skinfood products the prob is its so hard to find/buy here in the US and ebay doesnt have all skinfood items ... do u know any multiply sites that i can buy skinfood products that ships in the US? their powders really are love! too bad lng skinfood is so darn overpriced here in manila! I also have NARS loose powder, it looks great but doesn't do much for controlling oil! Nice photos Kym! :) I sometimes keep a pot of Maybelline's loose powder - not the mineral kind. It was an old set but still works okay. 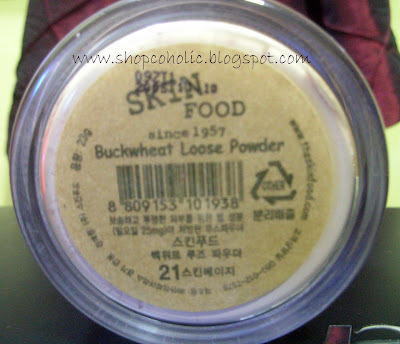 dunno if they still have it though considering they replaced their loose powders with the mineral ones. does this have a silky texture? Ayoko na ng HD powders parang may something sa texture nila na hindi ko gusto! not "too" silky texture, like Palladio's rice powder I guess, but its good in controlling oil..
Hey girls! Pre-orders for Skin Food Items are on-going up to May 7. Please check our site http://thedidishop.multiply.com/ for items and prices. Products will arrive on May 12. 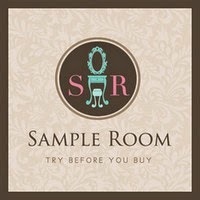 Prices are super cheap compared to the mall and other re-sellers. Thanks! This product helps to keep the make up long lasting. The last time I checked this product cost around $18 or more. You can also apply eye wrinkle creams to reduce the ugly signs of aging such as fine lines and wrinkles.